"Upcountry Tamil parties are preparing to make opportunistic deals to prop up this government as soon as the provincial polls are over this month. What do the people of upcountry gain by their politicians joining each government that comes to power? Nothing", said Mr. Vadivel Devaraj, editor of the Sunday edition of the Tamil daily Virakesari, speaking at a book launch in Colombo Sunday. "This government is tottering on the verge of imminent collapse. All the political leaders of the hill country are trying to prop it up. If money is generously given to them, then they would extend their support generously. Our people who have toiled for generations in the hill country plantations remain are still afflicted by destitution and powerlessness in politics, education, economy and in society. They do not stand to gain anything by supporting governments that come to power. But upcountry politicians cannot survive without being in a government because they cannot be without luxury vehicles and the privileges of ministries. They are dividing and politically destroying upcountry Tamil society for selfish gain", Mr. Devaraj said. 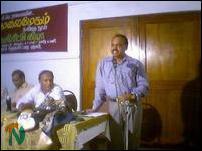 He was speaking at the launch of 'Malai Meham', a book by veteran plantation trade union leader, C.V Ramaiah, on the "social and political ills that plague upcountry Tamil society" at the Sugathadasa Stadium Hotel near downtown Colombo Sunday. In conclusion Mr. Devaraj quoted a stanza from the book of long free verse -"The ministers whom we elected declared open liquor shops. The habit of drinking has now spread like that of drinking butter milk. The stench of arrack is everywhere. It is destroying our society's roots, proclaiming that there wont be emancipation for us". A Hindu priest, a government education official and two upcountry writers spoke about the book and Mr. Ramaiah.